As you deck the halls this holiday season, be sure to keep the safety of your pets in mind. While certain plants help to add a festive touch to your home’s interior, some seasonal favorites can be toxic to dogs and cats. If a curious pet ingests a poisonous holiday plant, it can lead to vomiting and other adverse health effects. And this series of events is not uncommon during the holidays. Last year, Healthy Paws Pet Insurance processed more stomach-related claims than any other. The process of ridding your pet’s body of a poisonous substance may be as uncomfortable for your furry companion as it is for your wallet. Vet bills can quickly add up, especially for those without pet insurance. Healthy Paws noted that it reimbursed an average of $703 per incident for stomach-related claims during the 2015 holiday season. Luckily, there are many ways for pet owners to keep their dog or cat from eating a toxic holiday plant. The first step, of course, is knowing which plants can wreak havoc on your pet's system if ingested. As a means of adorning your home in natural sources of holiday colors and scents, holiday plants can’t be beat. However, pet owners should keep certain live plants on shelves or in places that are inaccessible to pets. Poinsettias. These popular plants have a sap that can cause vomiting and will irritate an animal’s mouth and stomach. Holly berries. Both the berries and the leaves that ensconce them can cause vomiting, diarrhea, belly pain, and depression. Mistletoe. Mistletoe is known to be extremely toxic to pets. Pets who have ingested mistletoe should be taken to the veterinarian immediately. Pine tree needles. Pine tree needles can be toxic and cause irritation of a pet’s mouth. Lily. This plant is deadly to cats. Any animal that has swallowed any part of a lily should be taken to the veterinarian immediately. Got a plant-loving cat who can easily climb to wherever you place your plant, or a chew-happy pup with an affinity for consuming things he shouldn’t? Consider opting for faux plants instead. You can also try restricting your pet's roaming space while you’re out. 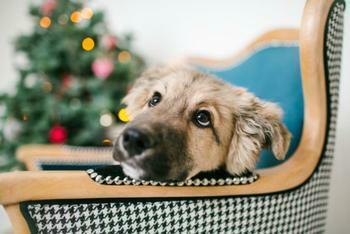 By blocking off rooms with potentially dangerous plants or holiday decor, you can reduce your pet's risk of getting into trouble.